Do not leave your fog machine sitting out! 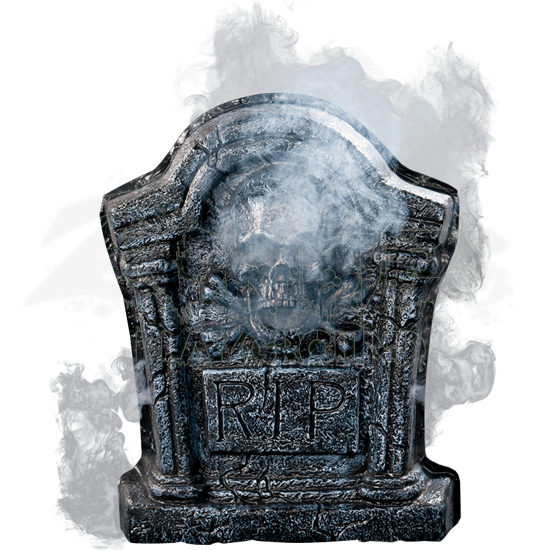 Decorate it with true Halloween zeal and make it a part of your decor with this Tombstone Fog Machine Cover! Slip this cover over your fog machine and it will look like it belongs in an old, gothic graveyard. This tombstone cover features a fabric and zippered back that is designed to fit over any standard fog machine. This cover stands at an overall height of 24 inches. It features the appearance of a cracked and worn tombstone that features column-styled sides and an arch top, with a skull and crossbones design at the center. Just under the skull and crossbones sits the classic phrase RIP. Once properly secured, the fog from the machine pours out of the skulls open eyes and mouth. Do not run the risk of your fog machine sticking out amid your great Halloween decorations! Cover it up with the Tombstone Fog Machine Cover and make that machine a working part of your decor that is bound to impress everyone that sees it.